Four masters competed in tonight’s top quad. NM Joshua Colas and NM Ian Harris tied for 1st with 2.5/3 each. The second section was a six player swiss. 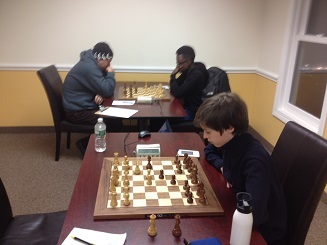 Favorite Leo Bykhovsky fell in round two to the eventual tournament winner CCFC Director Melvin Patrick. Guy Colas also finished with 2.5/3 to share first place.